OM Plus Fleet Manager (OMP FM) is a comprehensive printer fleet management software system. OM Plus Fleet Manager is a tool that helps users and Service Providers manage an organisation’s print and multi-function/copy devices. These devices store information about their activity, which can include data such as page counts, colour vs mono prints, copies, scans, faxes, errors, device health, toner levels, and much more. Our printer fleet management software helps users and service organisations by collecting this data, analysing it, and presenting it to users to automate the consumables ordering/ replenishment, technical support, and maintenance functions. Device volumes also allow users and service providers to optimise device deployment. The data is presented in an organised and easy to use manner via a browser interface. Further, OM Plus Fleet Manager helps manage the print fleet by automating consumable ordering, collecting device usage data to assist with equipment optimisation, and identifying devices with problems so that repair can happen quickly and uptime optimised. Using the OMP FM printer fleet management software can reduce costs, improve efficiency and increase printer fleet uptime. Present meters and device information including life-counts, colour printing mono printing, off the glass activity and more. Provide device profile information including model, make, duty cycle, features, firmware level, location, keyops, part numbers, and much more. Automate the toner replenishment process by detecting customer settable thresholds for ordering toner. Notify the responsible party for replacing toner cartridges at the optimal time in order to reduce waste. Produce consumable order reports with part numbers and vendor data to automate the ordering process. Detect printer and device alerts and utilising a customer settable system providing notifications to the specific responsible individuals. Produce reports on device usage, toner consumption, meters, and much more. Capture device meters and usage data. All information regarding the devices is displayed on a device detail screen for quick easy reference. The users access the system via their browser. OM Plus FM print fleet software utilises its own security system which authorises the users access and function. Plus Technologies has developed an easy to use and navigate system where all the information to manage a printer fleet is at the user’s fingertips. One area of differentiation is the programmability of OM Plus Fleet Manager. Users can add functions on their own without involving Plus Technologies, such as defining new alert types, defining new notification profiles, searching logs for custom information, individualising SLA’s, creating new reports, and much more. 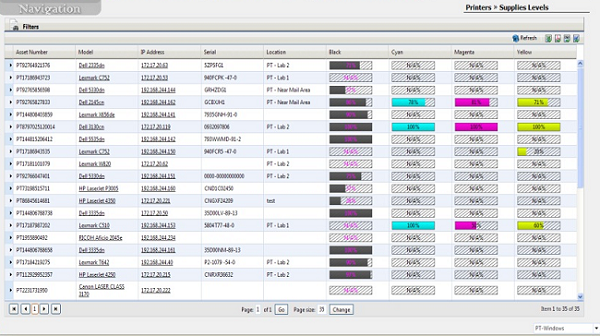 OM Plus Fleet Manager software may be used inside the customer firewall or it can be hosted. Our printer fleet management software can also be added to an existing OM Plus Delivery Manager print spooling system as an upgrade module. OM Plus Fleet Manager is aggressively priced and is available via an ILF, Subscription or Usage-based licensing model.